A cake marriage made in heaven. 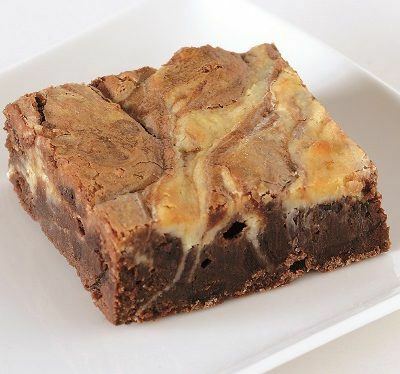 Rich, dark chocolate brownie with cheesecake mixture lovingly swirled through. Baked together to give a decadent alternative brownie. Sugar, Dark Chocolate (20%) (Cocoa Mass, Sugar, Cocoa Butter, Emulsifier: Soya Lecithin; Flavouring), Full Fat Cream Cheese (Milk) (14%) (Full Fat Cream Cheese (Milk), Salt, Preservative: Potassium Sorbate), Egg, Wheat Flour (Wheat Flour, Calcium Carbonate, Iron, Niacin, Thiamin), Butter (Milk), Rapeseed Oil, Flavouring, Raising Agents: Disodium Diphosphate, Potassium Hydrogen Carbonate. Made in an environment where other gluten containing cereals, nuts, sesame and mustard seeds are used.